Jeremy Duns is the author of the Paul Dark series. 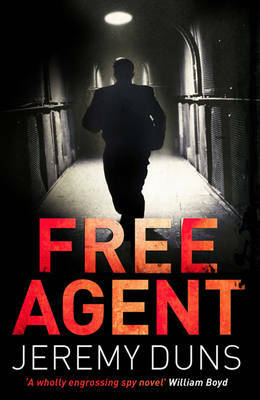 Free Agent came out in paperback in June and Free Country is out in hardback on 5th August. It’s a Sixties spy series following in the tradition of authors like Ian Fleming. We reviewed Free Agent and loved it so I was delighted when Jeremy agreed to meet me for a chat at the Theakstons Crime Festival in Harrogate. We talked about the books of course, but also about the war it’s set against and a little about Jeremy himself. The audio is available here and worth a listen. 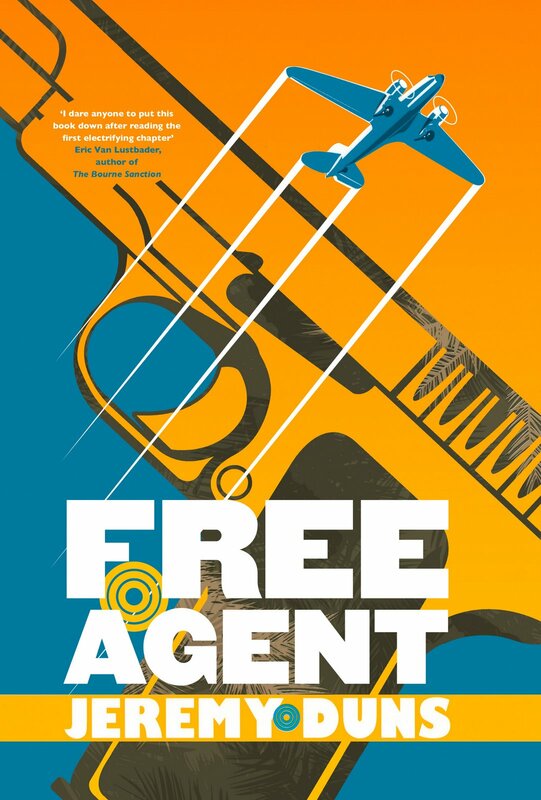 Free Agent is set in the Sixties – what was t he appeal of the Sixties spy stories? JD: I wasn’t into spy stories that much. I’d read a few, then in my 20’s I was a journalist in Belgium and I had an interview to do with a fashion designer in Antwerp. I arrived rather early and there was a bookshop opposite that had loads and loads of British thrillers, lots of which were spy novels. I bought three or four for a few cents for fun, and read them. They were rather good so then I read lots of spy novels for a while. I really liked the Cold War ones and particularly the Sixties. So when I was thinking about writing one I thought it would be nice to do the Sixties, but the real Sixties, and to do a bit of a different Sixties than Woodstock, JFK, Vietnam, all the stuff you normally see. I was searching for a way to do a new take. So you used the Biafran war. JD: I grew up living in Nigeria and was aware of the Biafran War when I was there, but didn’t know much about it. When I started researching I knew I didn’t want to set a Sixties spy novel in Berlin or Eastern Europe because it’s been done rather a lot, so I was thinking about where to set it. The Cold War really took place all over the world so there were lots of aspects that hadn’t really been explored. I looked at several things, but eventually came round to Nigeria and the civil war with the breakaway republic of Biafra, which was an absolutely horrendous civil war. It was particularly horrendous and particularly shocking for the West because it was the first televised suffering in Africa that people saw in the West. Researching it, I was amazed by how a big a story it was then and how forgotten it is now. If you look back at newspapers from that time Biafra was sharing the front pages with Vietnam with equal prominence, if you look at Newsweek or Time, the British newspapers, they were all about Vietnam and Biafra and now of course everyone knows about Vietnam and far fewer people have remembered that war. So that’s why I was interested in it. Do you think there is any particular reason Vietnam is better remembered? JD: Vietnam the Americans were directly involved in, so Hollywood ten or fifteen years later started making a lot of films about Vietnam. America had an interest in it and Hollywood is the biggest factory of entertainment in the world. They stayed out of Nigeria, they broadly supported the British government’s position in a slightly similar way to how the British government broadly supported the American position in Vietnam but didn’t send troops.- So it was a political support: technically they were neutral and didn’t get involved. They didn’t lose anyone in Nigeria, so it was a ‘foreign’ war. Sadly, Biafra was one of the first wars in Africa post-independence, and there have been many more since, so although it was shocking at the time it’s now become almost de rigeur. There have been many horrific civil wars in Africa since Biafra, so why remember that one in particular. But there are lots of reasons you should remember it: Médecins Sans Frontières was founded as a result of that war. It was a superpower conflict, which I explore in the book and found fascinating while researching, that is not really discussed any more – not in those terms. It’s discussed in the terms of the starvation tactics and the propaganda war, but the British, French, the Soviet Union, the Chinese, Israel, Portugal, all these countries were picking sides in this war and supporting different sides, playing off each other and providing arms in some cases. That’s why I was interested: t was a Cold War superpower conflict by proxy. Paul Dark is set up in an interesting position. Were you worried he would be unsympathetic to readers? JD: No, I want him to be unsympathetic. He’s not a sympathetic character. I do want the reader to empathise with him, but he’s not a hero in anyway. It’s the first book in a trilogy and it starts with him committing cold-blooded murder of someone who is a really a family friend and it’s hard to sympathise with someone who commits a cold-blooded murder very early on. I had a lot of people, while I was writing it, in the writers’ group I was in, asking ‘Doesn’t he need to be sympathetic?’. I think it’s more important that he’s interesting and compelling and that you want to follow him – that you are interested in his predicament and how he reacts, and he’s human. He does some horrible things but I’m hoping you don’t sympathise with the horrible things but you understand in a way what could cause him to do it, that it doesn’t seem like he’s a monster. He has a lot of internal conflict. JD: It’s almost a writers’ group cliché in a way:‘You must have internal conflict and you must have a journey’. I think it’s essential. People wince when you say the character is going on an internal journey but if he wasn’t, if he was absolutely sure all the time, he would be utterly unsympathetic and there would be no empathy for him either and then you wouldn’t really want to read the novel. My idea with Paul is that he is a walking Cold War, he has East and West in his brain and that conflict is taking place within him. What is ideology, what is cause, how would you know in 1945 if Stalin was worse than Hitler or vice versa. We know in hindsight who appears to have won the Cold War, but it wasn’t so clear in the early stages to say ‘Oh, Commies are bad’. So he has a decision made for him very early in his life and it’s a hard decision to go back on. Paul’s ideology changes as the book progresses. Where is that going in the next book? JD: In a way it’s difficult to talk about this without revealing that Paul is a traitor, a double agent. He’s inspired by Kim Philby and Burgess, Maclean and the rest of the Cambridge Ring. I’ve read Philby’s memoirs and they are shocking because they are so charming and deadpan. There is a very dry wit, but he betrayed dozens or hundreds of people knowingly. So with Paul Dark his shift throughout the trilogy is from a position of certainty that he is serving the right cause, the Soviet Union – he realises at some point that the Soviet Union is not quite the land of peace and freedom and that communism and Marxism aren’t going to succeed in bringing about equal society and the brotherhood of man. He realises in fact he is working for a brutal dictatorship and he doesn’t really have any choice in it. He can’t just go to them and say ‘OK, I’ve changed my mind I’d like to go back to being loyal again’. When he was 20 and emotional and had very simplistic ideas about changing the world, which a lot of people had at that time, it was an idea that didn’t stem from evil. I don’t think anyone decides to betray their country because they feel like being evil. He thought he was doing good and was going to change the world. The idea for the trilogy is that the false perception he has of ideology and doing good is challenged and that by the end of the trilogy he has understood what you actually have to do if you want to change the world and what the real shades of grey are in the ideology and the causes. At the end of the first book he thinks he has escaped from under the thumb of the GRU, the military agency of the Soviet Union that he works for, but then he’s drawn back in against his will. In the second novel, Free Country, he has to face up more to the mistakes he’s made. Tell me how you came about the lost Fleming script. JD: Well I became interested in Ian Fleming because I was interested in all the spy books – I’d read a few when I was younger and didn’t really like them, but reading them again I thought they were fantastic fun and he was a tremendous stylist. Fleming has a glittering prose. I became very interested in him and read a couple of biographies, did some research. I was a journalist before becoming a writer and I was always interested in footnotes, things between the lines and stories that had not yet been fully explained. I was reading the letters of Kingsley Amis and he wrote one in 1965 in which he casually mentioned that he was working on a script he wasn’t very happy with for a film producer, ‘based on an original Fleming idea’. So that was the sort of seed. It took a long time to research but eventually I realised that Amis had worked on an adaptation of a non-fiction book of Fleming’s called The Diamond Smugglers, which was an investigation into diamond-smuggling in the Fifties. There had been huge plans to film that book, of which Amis was just a tiny part, and eventually I discovered a script written by an Australian writer called Jon Cleary set in South Africa in 1964 and managed to interview Jon Cleary and read the script and I did an article about that for The Sunday Times. So there are no plans for it to be revived? JD: Well I think it would be fantastic: it’s a great script. It’s very much of its time and has some things in common with the Bond films, but it’s much grittier. They wanted Steve McQueen to play the agent, John Blaize, and I think you could still film it – it has some terrific stuff in it, some terrific villains, a car chase through an elephant stampede! I’ve no idea what the rights situation is and the entire Bond franchise is on hold because MGM are having some financial difficulties. But it’s there, it’s in Jon Cleary’s papers, anyone could option it I’m sure, and I suspect it would make a very good film if it was made. You grew up partially in Africa and Asia. JD: My father worked for a multinational called Unilever, so we moved around every three or four years from country to country, so I lived in Nigeria, Malaysia, Indonesia, India briefly. Nigeria I was in during a formative part of my childhood and was there for about five years. Although I was born after the Biafran war, I used a lot of sense memory from my childhood writing the book. I’ve lived in a lot of different countries and get asked a lot where in England I am from which I can’t really answer, but I went to boarding school in England, so my wife thinks I cheat a bit saying I grew up in Asia and Africa! So did you revisit that writing the book? JD: No – I considered it, but part of the reason I didn’t is that Nigeria has changed a lot, but the main reason is that it’s set in a war and you can’t recreate that. Almost everything I was writing about was different: Lagos was under a curfew. It’s not just that the hotels and bars and restaurants aren’t still there – some of them are – but I was most interested in finding out the politics of the war and finding out what happened during the war, which you can’t get by going there. I read an awful lot, and watched a lot of films, but mainly read, for about a year before starting the book. For the second book, Free Country, which takes place partly in Istanbul and is mainly set in Rome, I did visit Rome, which helped but also did not help, as it’s tempting if you see something interesting to want to use it, but it may not have been there in 1969. Rome now is not as different from what it was like in a stormy but peaceful 1969 compared to Nigeria now and Nigeria in the midst of civil war. It’s also easier to visit Rome. Researching Nigeria, I talked to my dad a lot about his memories, and my parents-in-law, who were not in Nigeria but were in Africa during the 60’s and they had lots of memories they shared with me. My mum had for some reason kept a map of Lagos’ golf course, which I use in the book. There is a chase across Ikoyi golf course, and I remember it from my childhood, but exactly where the holes were in 1969 is rather a difficult thing to find out. But I had this little map, so I mapped out the chase. They also had a book about the history of the Lagos Yacht Club, so I had a whole bit of chat in the novel where they talk about the rules of the club and that’s all taken from what the situation was at the club in 1969. So I had great fun looking at all these sorts of things. I mainly did it from home – I interviewed a couple of people, but mainly read books. And you put Paul through hell – and not just him. JD: Yeah quite a lot of people die in it, it’s quite brutal! And I wanted to put him through hell – he actually dies at one point in the book. I don’t like films where the secret agent does all sorts of things and then just dusts his hair off and gets on with the next thing. If he’s going to go to Nigeria in the civil war, he’s going to have to suffer, too. He’s an outsider, a white Westerner – I don’t think it’s going to work if he’s just going to solve everything and whisk off again. It was vital and more interesting and compelling that it’s extremely difficult for him. Much harder than you would have thought. And there are some fairly harrowing moments for people captured by various sides and the treatment of the journalists. JD: It was a massive media story and the character of Isabelle is a journalist – that whole idea is interesting to me, of being a foreign correspondent in a war and what really is your responsibility reporting on a war? She’s based partly on my concerns about idealism in journalism. Where Paul has the naive idealism at the start, I think a lot of journalists had a very naive idealism about Biafra, and wanted to portray the war in a particular way and had a particular image of how it should be. She’s a naive character – and you can’t be that naive in a war. What sort of journalism did you do? JD: I worked for a number of years for a small expatriates’ magazine in Belgium, an English-speaking magazine called The Bulletin. Which was great. 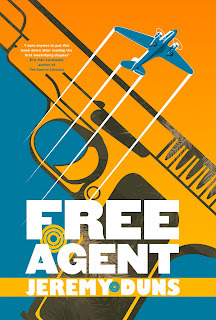 I got to do a lot of stuff – I did a lot of research for Free Agent under the guise of stories with an espionage bent, so I got to interview a lot of people. I wrote about a lot of different things: fashion, restaurant, bars, watches… the history of espionage and warfare! Belgium is a fascinating country. It’s very small, but a lot happened there. I interviewed Jean Claude Van Damme when I was there! It was a wide and varied experience. And you were involved in emergency plans? JD: I got a job in Stockholm, where I now live, and worked for a year for the European Centre for Disease Prevention and Control. I was in the communications department and we did some work planning what would happen if there is a pandemic like bird flu. It was an interesting experience. What’s took you to Stockholm? JD: My wife is from a group of islands between Sweden and Finland called the Åland islands, and that’s actually part of the setting for the third novel. As a journalist in Brussels I’d visited Stockholm and it’s made up of islands so it was very beautiful and very calm. I wanted to move immediately, but it took us about five years. Finally, just for the blog, what is your favourite Bond gadget? JD: My favourite Bond gadget is the attaché case 007 has in From Russia, With Love, with hidden compartments for a tear gas canister, gold sovereigns, a throwing knife, a collapsible sniper rifle and ammunition. I wish I had one! Set at the end of the 60’s and filled with cold war intriuge and double agents, Duns’ novel follows in a fine tradition of spy novel and does so brilliantly. Paul Dark is not a likeable man, but surprisingly easy to empathise with and understand which makes him extremely readable. He is also far from being a hero, which is always refreshing, he’s not even an anti hero, he’s just a not very nice man doing what he has to in order to survive under extreme circumstances. In fact no one in this novel is really likeable or heroic, quite rightly the spies are a thoroughly untrustworthy and unpleasant lot, regardless of who they work for. Free Agent is as set against the cold war and the Biafran war so the setting for much of the novel is Africa and it’s wonderfully rich with detail from the period. The golf course in the novel is recreated from a period map, and the feel and flavour of the place comes in part from the authors own experience of being there as a child, and that of friends and family. Duns’ creates a real sense of place and of the reality of the war and life at the time which successfully grounds the story and maintains a sense of reality that is sometimes lacking when dealing with slightly surreal world of secret agents. Being a current writer creating a 60’s spy novel Jeremy Duns offers us the drama and action of Bond but without the dated feel of a novel written decades ago. There is little technology mentioned, and none explained in detail, although there are specifics about the guns, which is appropriate. It’s a neat balancing act that makes this a much easier read than some of the older books of the type. Free Agent is a wonderfully grey novel, Dark’s own beliefs and behaviour, the behaviour of various governments, the attempts by the superpowers to gain the upper hand through influencingthe situation in Africa. As a reader I felt at times like the young french journalist, a little wide eyed and niaive, not willing to believe the story would take the turns it did. It maintained the tension, punished it’s lead again and again and delivered on the dramatic climax. 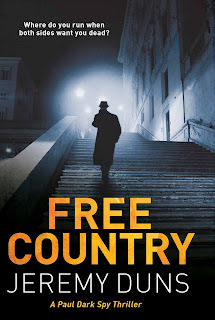 A must for fans of the classic spy tropes and a strong recommendation for anyone thinking of giving the genre a try, personally, I can’t wait to get into the next one, Free Country out 5th August in the UK. We interviewed Jeremy at the Harrogate Crime Festival and the interview will be posted shortly as both typed and audio.